Joystick Gremlin is a program that allows the configuration of joystick like devices, similar to what CH Control Manager and Thrustmaster's T.A.R.G.E.T. do for their respectively supported joysticks. However, Joystick Gremlin works with any device be it from different manufacturers or custom devices that appear as a joystick to Windows. Joystick Gremlin uses the virtual joysticks provided by vJoy to map physical to virtual inputs and apply various other transformations such as response curves to analogue axes. In addition to managing joysticks, Joystick Gremlin also provides keyboard macros, a flexible mode system, scripting using Python, and many other features. Joystick Gremlin provides a graphical user interface, described in Section 3, which allows commonly performed tasks, such as input remapping, axis response curve setups, and macro recording to be performed easily. Functionality that is not accessible via the UI can be implemented through custom modules, explained in detail in Section 4. It's important that the VC Redistributables are the x86 ones, even if you're running a x64 system, as vJoy and Python require the 32bit libraries. In order to properly use Joystick Gremlin vJoy has to be configured first. This is done via the Configure vJoy program. This program allows setting the properties of all existing vJoy devices. Typically a single vJoy device is enough. 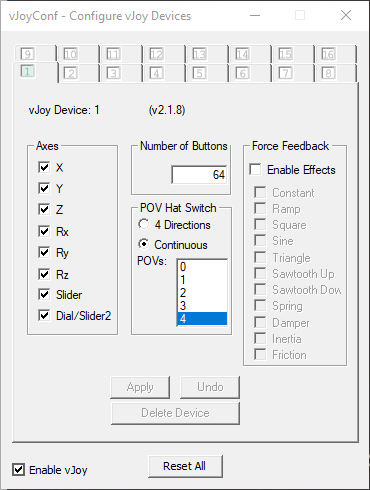 In order to use 8-way POV hats with Joystick Gremlin the hats have the be configured as continuous in vJoy. The image below shows what a properly configured vJoy device looks like. Once everything is set as desired clicking Apply configures the vJoy device and the window can be closed. VJoy configuration dialog with settings required for proper Joystick Gremlin operation. The following section introduces the terminology used by Joystick Gremlin. Next, the different concepts will be exapleined starting with individual actions and ending with a complete profile. An input is an axis, button, hat, or keyboard key on a physical device. An action is something Joystick Gremlin executes in response to the user activating a physical input. Examples include running a macro, sending button presses to vJoy, or changing to a different mode. Each action has a condition attached to it which can further dictate when an action is to be executed. A container holds one or more actions and uses them in the manner specific to the particular container. In the simplest case it simply executes the action(s). More complex cases are where the container decides which action(s) to execute based on the duration a button is held down. A device is a physical controller connected to the computer such as a joystick, pedal, or throttle. Each device has multiple inputs with their own associated actions. A mode is a collection of actions associated with the inputs for each connected device. Each mode can inherit from one other mode, his parent. If a mode and its parent both define actions for the same input only the actions of the mode and not its parent are used. If the mode defines no actions for an input but the parent does the parent's actions are used. This allows having a common set of base actions that more specialised modes add to or change. A profile is a folder which contains a XML configuration file together with any custom modules used. The profile contains the settings made via the user interface for each of the connected peripherals. The following is a simple example showing how the above introduced concepts work together. The profile contains two modes, Default and Landing and two physical devices Thrustmaster Warthog Stick and CH Pro Pedals. Both devices have varying actions executed on the exemplary inputs used which change between the two modes. The image on the right shows the conceptual nesting of the concepts as shown in the explicit example. The image shows how the various concepts explained below relate to each other.